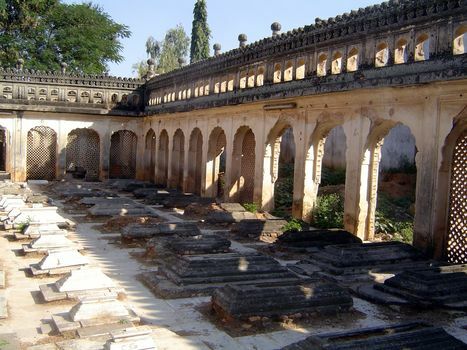 Apart from the family of the nizam, the highest ranking nobles in princely Hyderabad were the Paigah nobles. "Paigah" is not a family name; it's Farsi for "footstool." An English equivalent might be "right-hand man," though that phrase has a casual tone far removed from the refinements of the Hyderabadi court. 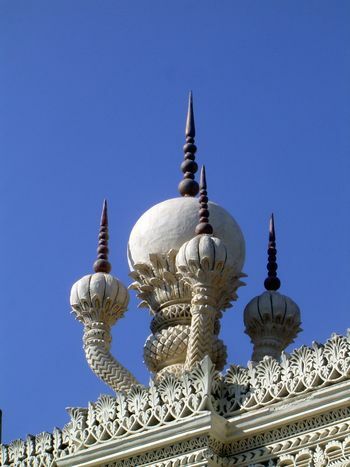 The Paigah tombs are perhaps the most beautiful things in Hyderabad today. 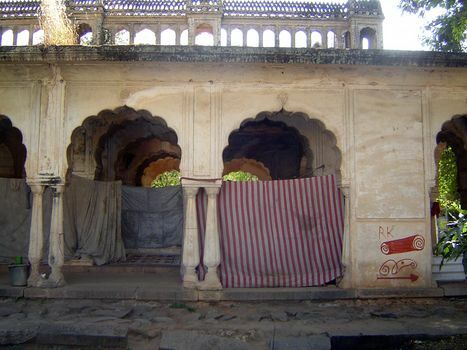 The tombs are about three miles east of Char Minar and in what is now a suburban district. 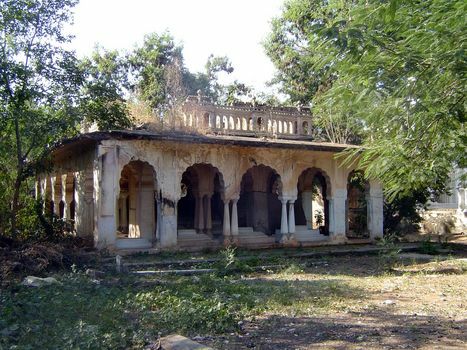 Twenty years ago, they were neglected and taken over by squatters, but now the government has taken an interest in their preservation. We're on the tomb grounds here, looking at a subsidiary group of tombs called Ghansi Miyan. It gives some sense of what the complex looked in 1980. Especially with the squatters who have moved in. Opposite is a small cemetery of the Paigah children who died young; it's called Khavas Pura. Here, freshly whitewashed, is the main tomb complex. The view here is eastward, with a small masjid, or mosque, behind the camera. The first noble to be given the rank of Paigah is just beyond the pool, and his successors are lined up behind him, each hoping to catch the sound of daily prayers from the mosque. 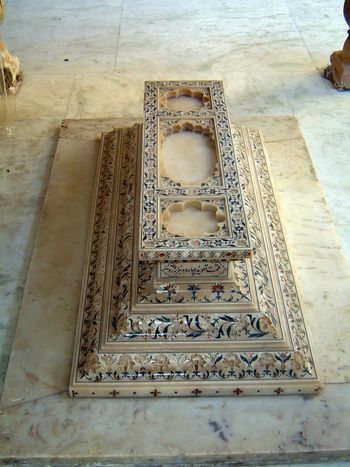 The tomb of the first Paigah noble, Abul Fateh Khan, whose titles included Shams-ul-Umra, "Sun of the Nobles." It's comparatively simple but fronts directly on the pool in front of the mosque. 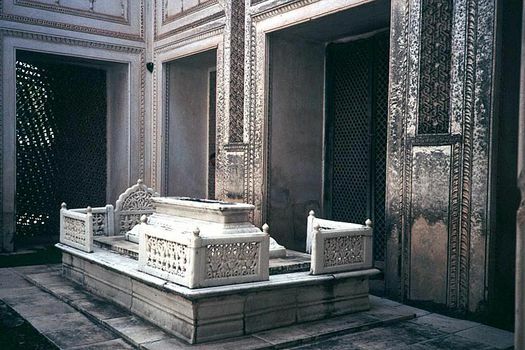 We've stepped back one tomb to a space between the first Paigah noble and that of the greatest of them. 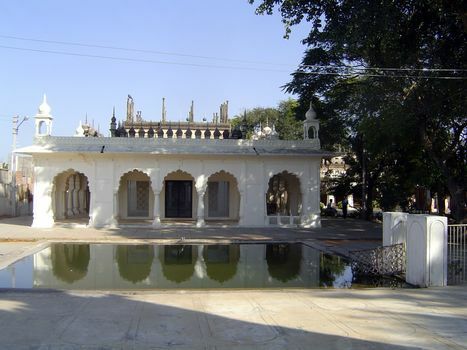 In this intermediate space is the tomb of Bashir ud Daulu, Asman Jah, grandson of a nizam and married to the fifth nizam's daughter. One of the consistent design objectives of these tombs is to screen out the otherwise torrid sun. 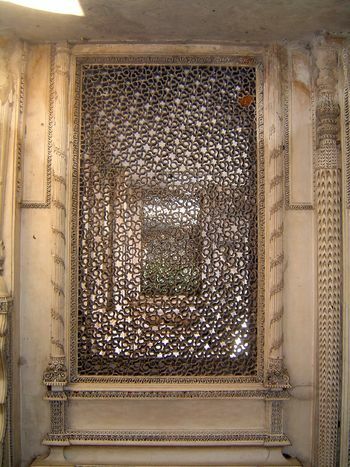 To do that, they employ jalis or pierced screens, some of wood and some of hard lime plaster. 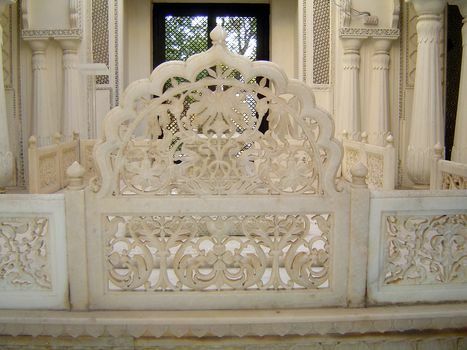 (In North India, for example at Fatehpur Sikri, the jalis are of stone. Why stone was used here only for small pieces is unclear; it may that marble or sandstone simply could not be transported many hundreds of miles without breaking.) Typically, too, the tombs are open to the heavens, yet shaded. Notice the curious roof ornaments out there in the bright sun? Here's a close-up of those Grecian horns. 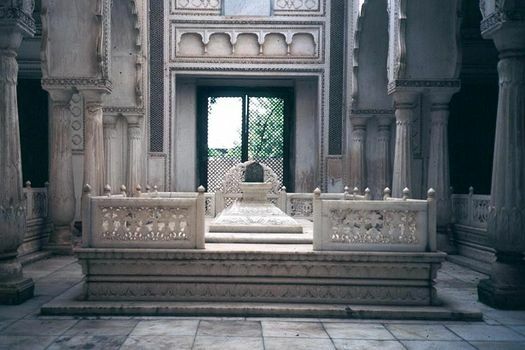 Another view of Asman Jah's tomb. 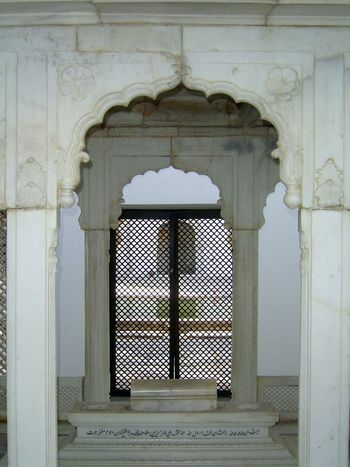 The screens around the tomb itself are marble, not plaster. Another tomb as it was in 1980. 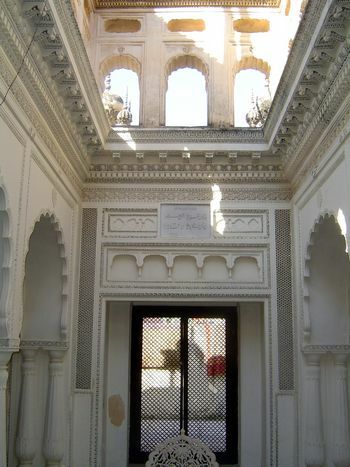 Asman Jah's tomb after restoration. 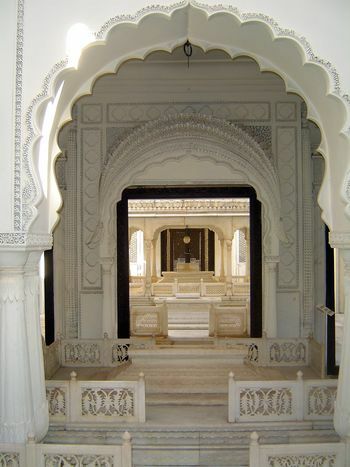 We're looking east to the third structure, that of Fakhruddin, the only son of Abel Fateh Khan. As Shams ul Umra II, Fakhruddin married Bashir un Nissa Begum, the daughter of a nizam. 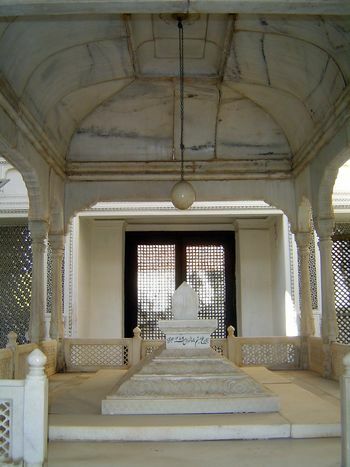 A closer view of Fakhruddin's tomb. The ostrich egg--real, though empty--symbolizes his fecundity. The tomb in its setting. Looking east to plaster and wood jalis. 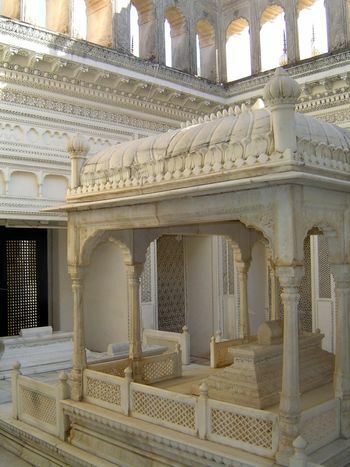 The tomb of Hussain un-Nissa Begum, a daughter of the fifth nizam. 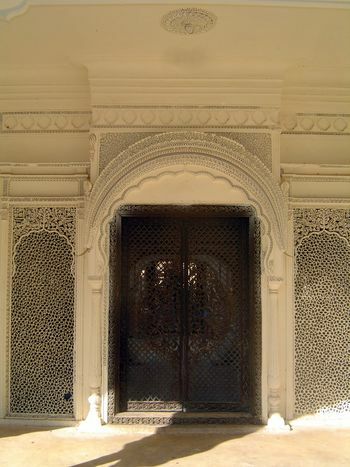 It's unique among the Paigah tombs for its insets of hard, semi-precious stone, a mosaic technique called pietra dura. 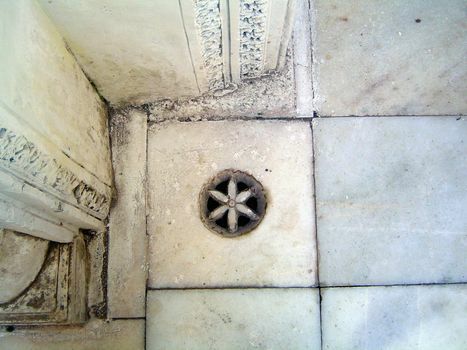 Off center from the axis of the tombs is that of Latif-Un-Nissa Begum Sahiba, the mother in law of Hussain-un-Nissa. 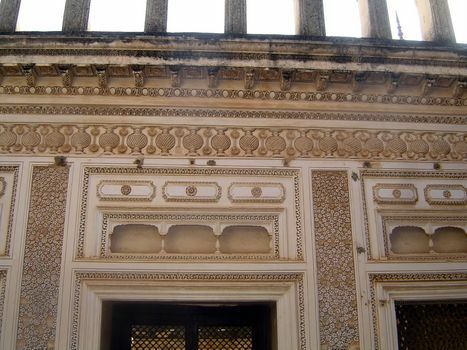 The enclosure is covered with carved plaster. 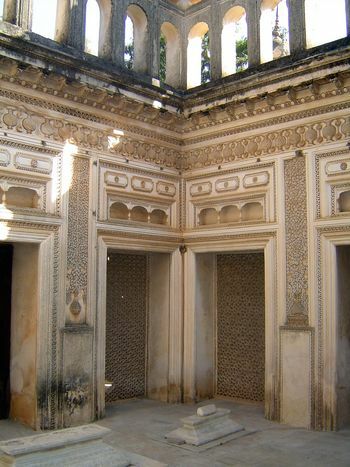 One of the enclosure's jalis.